Attractive design. The loop on the back of the case lets you attach the case to your belt, or it can be carried using the included strap. Special extra: The smart double zipper solution means that the camera can also be worn on your hand using the hand strap. 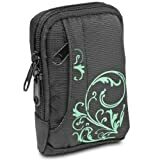 The small front pocket provides convenient and easy-to-access storage space for a battery or memory card. The pocket is disguised into the design of the case, keeping the design wonderfully chic. (Interior) 100mm x 60mm x 25mm. A selection of the appropriate camera models can be found below in Product Description.